[Num,Den,AllpassNum,AllpassDen] = iirlp2mb(B,A,Wo,Wt) returns the numerator and denominator vectors, Num and Den respectively, of the target filter transformed from the real lowpass prototype by applying an Mth-order real lowpass to real multiple bandpass frequency mapping. By default the DC feature is kept at its original location. [Num,Den,AllpassNum,AllpassDen]=iirlp2mb(B,A,Wo,Wt,Pass) allows you to specify an additional parameter, Pass, which chooses between using the “DC Mobility” and the “Nyquist Mobility.” In the first case the Nyquist feature stays at its original location and the DC feature is free to move. In the second case the DC feature is kept at an original frequency and the Nyquist feature is movable. This transformation effectively places one feature of an original filter, located at frequency Wo, at the required target frequency locations, Wt1,...,WtM. Relative positions of other features of an original filter do not change in the target filter. It is possible to select two features of an original filter, F1 and F2, with F1 preceding F2. Feature F1 will still precede F2 after the transformation. However, the distance between F1 and F2 will not be the same before and after the transformation. Choice of the feature subject to this transformation is not restricted to the cutoff frequency of an original lowpass filter. In general it is possible to select any feature; e.g., the stopband edge, the DC, the deep minimum in the stopband, or other ones. 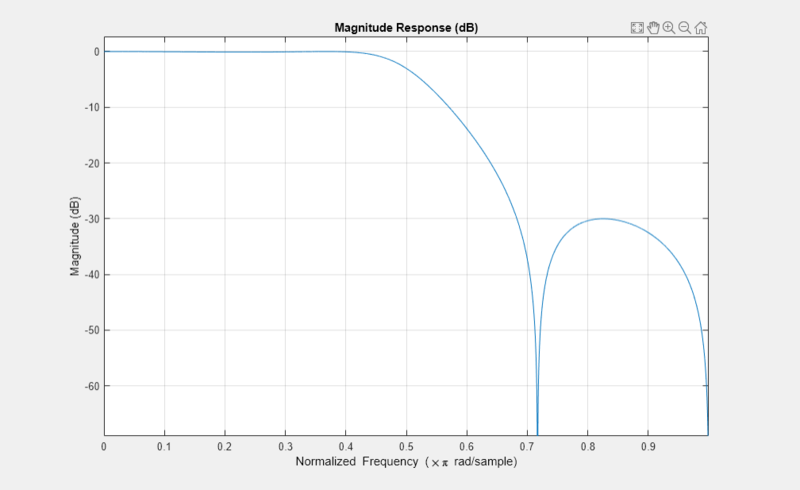 Create a real multiband filter with two passbands. Create a real multiband filter with two stopbands. Franchitti, J.C., “All-pass filter interpolation and frequency transformation problems,” MSc Thesis, Dept. of Electrical and Computer Engineering, University of Colorado, 1985. Feyh, G., J.C. Franchitti and C.T. Mullis, “All-pass filter interpolation and frequency transformation problem,” Proceedings 20th Asilomar Conference on Signals, Systems and Computers, Pacific Grove, California, pp. 164-168, November 1986. Mullis, C.T. and R. A. Roberts, Digital Signal Processing, section 6.7, Reading, Mass., Addison-Wesley, 1987. Feyh, G., W.B. Jones and C.T. Mullis, “An extension of the Schur Algorithm for frequency transformations,” Linear Circuits, Systems and Signal Processing: Theory and Application, C. J. Byrnes et al Eds, Amsterdam: Elsevier, 1988.